Successfully Added Compact USB-C Hub - USB C, HDMI, USB 3.1, Full-HD Media Support, Compact and Lightweight, Aluminum Casing to your Shopping Cart. Easily connect your new USB C enabled laptop to all your old accessories and gizmos with this compact USB C hub. Thanks to its lightweight and compact design, this gadget can be easily carried along anywhere you go. This makes it a great gizmo for at work, home, or on business trips. The USB C hub itself comes with a premium aluminum finish which gives it a high-end touch and look. This beauty allows you to transfer media files in the blink of an eye and supports media with a resolution up to 2K. If you’re looking for a stable and fast USB C hub, this beauty is perfect for you. Thanks to its simple plug and play design, you can simply plug it in and you’ll be ready to go. 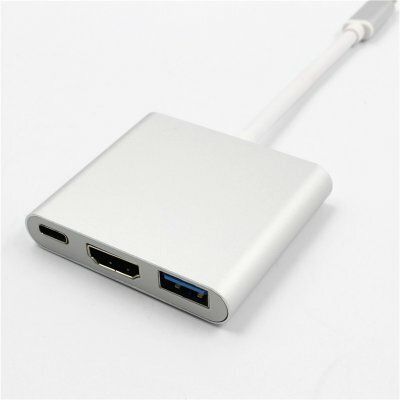 With its USB C, HDMI, and regular USB 3.1 port, this hub offers all you need to undergo a smooth performance. Never worry again about transferring files from your new USB C enabled gizmo to your older gadgets. Whether it’s files, music, or films - this USB C hub transfers them in the blink of an eye.